LAS VEGAS– Who was that team disguised in Oregon basketball uniforms playing at Colorado and Utah in the last round of Pac-12 regular season games? Certainly not the team Duck fans have learned to know this season and definitely not the same team that piled up 23 wins. Most assuredly, it wasn’t the same one that led the conference for nine weeks and was nationally ranked as high as 10th earlier in the year. What was the difference? Why this trip, with everything that was at stake? That’s a tough one. Lots of theories out there. Too much pressure? Or was it the travel? The high altitude? A bad team meal, perhaps? Maybe it was all the injuries that naturally pile up at the end of a long season? Illness? 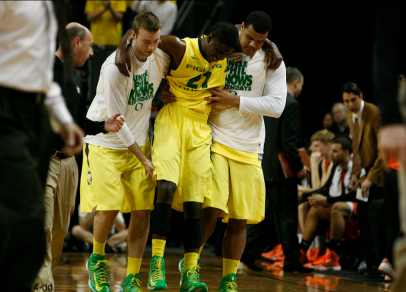 Fatigue: The Ducks seemed a step slow in both games. A certain look and body language that implied fatigue became more and more obvious as the Utah game unfolded. Hands were clutching shorts on dead balls, a dead-giveaway. Former Oregon coach Ernie Kent covered the Utah game on the Pac-12 Network. His take was that the Ducks looked tired early and could never match the emotion and energy of the 13-17 Utes, playing on senior day. Lack of Defensive Intensity and Effort: The lack of energy, lethargy, and fatigue were most apparent in Oregon’s defensive effort in both games. When the Ducks don’t play defense, it affects their offensive output tremendously. The Ducks are at their best when they get out and run, but they were stopped in their tracks in Salt Lake City. Utah is a half-court team that normally runs the clock down as far as possible before attempting a shot, but on this night, they inexplicably outscored Oregon 12-0 on fast break points. Poor Free Throw Shooting: Not coming through at the free throw line was another huge factor, especially when you’re trying to come from behind. The Ducks went into the week shooting a fourth best 72 % in conference play. Against Colorado and Utah, the Ducks hit 22 of 44 free throws for 50%. That’s not going to get it done, especially on the road, unless you make up for it in other areas. Physical and/or mental tiredness appeared to affect Oregon’s free throw shooting as many misses came up short, an obvious sign of fatigue. Beaten on the Boards: Rebounding, an Oregon team strength all season, fizzled in the Rockies. The Ducks were beaten soundly on the glass in both games. Despite not playing national rebounding leader Andre Roberson, Colorado thumped the Ducks on the boards. Utah, out-rebounded in Eugene by 22 caroms, controlled the backboards all game in the rematch and beat the Ducks in the paint 34-21, a big factor in their upset. 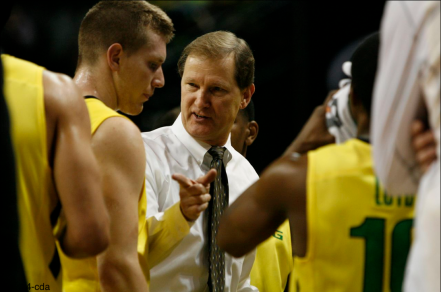 Coach Dana Altman with instructions for Singler in the Civil War Game. Sometimes in athletics, when you want something so much and it’s extremely close to your grasp, you tighten up under the pressure and tend to disappear in big moments or big games. With the exception of E.J. Singler against Utah and freshman Ben Carter off the bench in both games, most of Oregon’s regular performers did not contribute anything close to what they normally have all year. The Dominic Artis Effect: The transition of bringing Artis back into the lineup has been tougher on the team, and perhaps the coaching staff, than many people expected. Easing Dominic Artis back into the lineup after missing nine games is a delicate task. 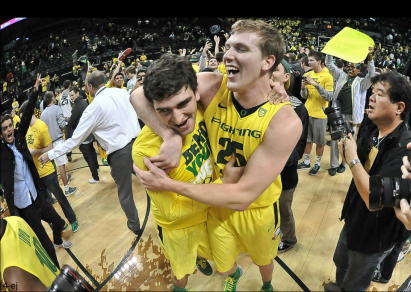 Altman has said that he will be patient with Artis and his return to action. Those that hold the expectation that he will come back and immediately be the player he was before he was hurt are unrealistic and will naturally be disappointed. His return, however, brings many positives, especially how he gives Oregon the ability to spread the floor because he is a constant perimeter threat. Loyd, his replacement, had been playing his best basketball when Artis was cleared to play, and suddenly, the playing rotation changed. 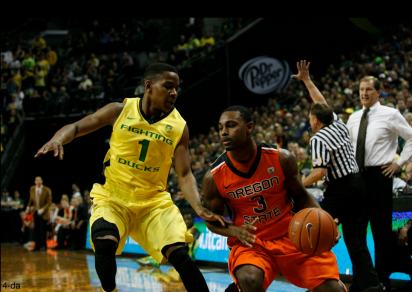 Loyd’s strengths are his quickness, and that he makes Oregon better defensively. He also brings an element of toughness to the Ducks demeanor that is hard to match. His point production spiked and his turnover-to-assist ratio improved with more minutes played when Artis was injured. Getting the most out of both point guards requires a delicate balance and there’s not much time at this point in the season to tinker. How it works out can affect team chemistry and it may be difficult to reach a level of comfort that existed prior to Artis’s injury. But couldn’t they just have sucked it up for one of the two games? The team just didn’t play Oregon ball. Against Colorado, nearly the entire squad seemed mysteriously disinterested and lacked energy. 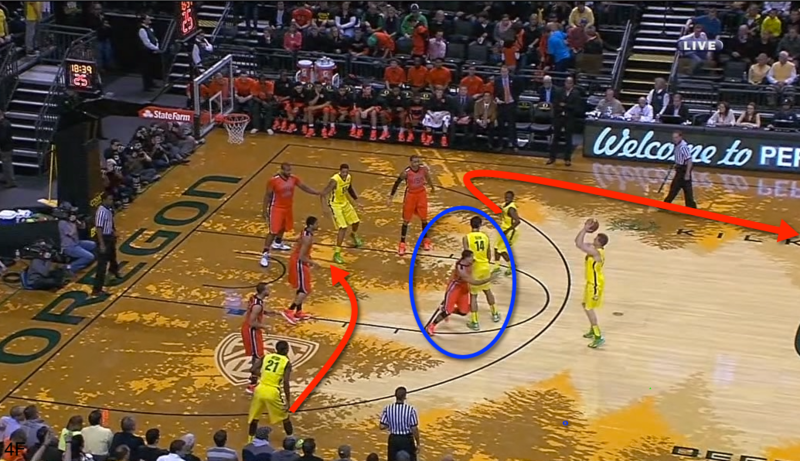 Two days later, Singler tried almost single-handedly to rally the troops back from a big early deficit. It was too little, too late. Why? Because Oregon failed to match the energy of the teams from Boulder and Salt Lake City as the league-leading Ducks came into both cities with a target on their backs. Beating a ranked team rarely occurs at Utah, and the Utes started strong and never looked back. Many Oregon players weren’t strong with the ball and the physicality of both games took more of a toll than it should have on the Ducks. Too much worrying about the officials didn’t help. 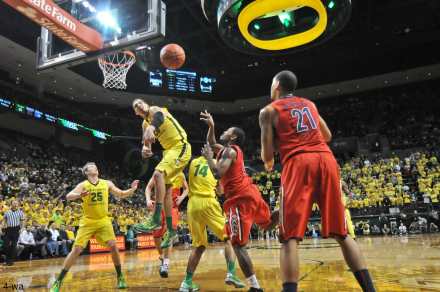 The result of the lost road trip will haunt the Duck players and coaches for a long time. Can Oregon turn it around and extend their season? Altman has said several times after losses this season that the guys on the team get over the disappointment of those games a lot quicker than the coaches and fans. What can be corrected heading into the Pac-12 Tournament? What adustments can be made? Oregon needs to bring more defensive intensity like this effort by Waverly Austin rejecting an Arizona shot earlier in the season. The first thing would be to flush the negatives from the road trip. Put the last two games in the rear view mirror and move on. The mental aspect of the team is difficult to evaluate from the outside, but the players should be reminded that this is still a very good basketball team. With the two late defeats, Oregon hit an untimely and unexpected obstacle, but there is still much to play for. Playing in the NCAA Tournament is still very much within reach for these Ducks, but to extend their season, the need for consistent leadership is critical. 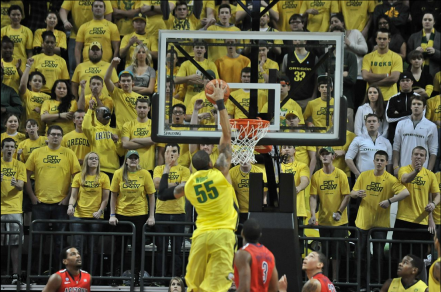 The Ducks need to finish better inside, like Tony Woods slamming this dunk home. The team needs to bring a heightened focus and concentration to their preparation and their game experience as tournament play begins. Oregon needs to block out the distractions of the glitzy host city and the disappointment from last week and concentrate on the basics, the fundamentals, and the little things that brought them success to this point. That would be crisp execution and ball movement, getting the ball inside, and finishing shots. Playing intense defense, blocking out, rebounding, and running the break. Finally, the team should relax, have fun, and enjoy the experience. Getting back to playing Oregon basketball will bring success and the opportunity to enjoy this week’s experience and extend the season.